According to the ABC the Bureau of Met tells us that Queensland has experienced “the worst drought in 80 years” and that “37.3% of the state was covered by the lowest rainfall on record”. (Watch it on iview if you can bear to). These exacting facts are easy to check, and Ken Stewart did, but the 1.1-billion-dollar ABC did not. Ken used the BOM’s own websites (Climate Maps and Climate Change and Variability) and shows that the current drought is the worst in 9 years, not 80, and even if it is very bad (heartbreaking for some) it’s not unusual. Current low rain is not unusual. Ken wrote to the ABC, and Genevieve Hussey replied immediately — effectively saying the ABC repeat all BOM claims, no matter how hyperbolic, extraordinary, or repetitive they sound. If millions of Australian citizens are misinformed, the ABC doesn’t seem too concerned. Not concerned enough to point at all the contradictions in their file footage of past droughts, or rainfall stats on the BOM’s own site. Not concerned enough to ask questions that 50% of skeptical Australians might be asking. Any serious journalist would have asked the BOM whether it was misleading to call this drought the “worst”, when the rainfall statistics so clearly suggest the opposite. Hypothetically, if the BOM was wallowing in a bureaucratized religious group-think, cherry picking their data, and adjusting data with inexplicable methods, the ABC would be defending them. Serving big-government, not the tax-payer. The point of the ABC is not to ask our public institutions any hard questions after all. It’s there to cover for them. Ken Stewarts post: Not the Worst Drought in 80 Years and ABC reply to my complaint. And to both our government continues to turn a blind eye. Yes, the one question – the ONLY question – is: what the hell is the Abbott government doing about it? Can’t do much. Clive won’t let them. However if there is any intelligence at all in the ABC management, they must soon start realizing that one day they may have to account in reasonable terms for their journalistic standards. Okay, so we are experiencing the worst drought in 80 years. It’s terrible, it’s devastating and it’s been done before. In fact 50 years before… “climate change”. These folks sure don’t see what they’re looking at. The ABC, the BOM and the climate science department of the CSIRO are all part of Australia’s left wing partisan political machine. At the ABC, misinformation is their most important product. With any luck the area in drought will have shrunk a fair bit by the end of next week, nullschool looks pretty good through Wednesday, but not so much within the worst-affected areas is indicated as yet. At least it’s clear now the ABC always parrot BOM’s highly suspect claims without review, but it’s not that simple, the advocacy we saw from people like Tony Jones, and many others, and at SBS, for the past decade, can not be just fobbed-off by saying we just report exactly what BOM says. There is a culture of advocating a theory, by people who are NOT scientists, and who actively lambasted any non BOM aligned voices. There is clearly both cultural baggage and a problem that goes beyond present day ABC policy. Actually, we are rather used to taking BOM claims as verbatim, since in the past they have made some half reasonable predictions of weather a few days out, Albeit sometime forgetting to look out the window! Now however with earth science overtaken by activist zealots we are faced with an abrupt about face of the reliability of the BOM, not only that, the weather prediction and hydrological services remain pretty good so there is a real schizophrenic nature to the BOM driven by the activism that is hard to digest. A good summary bobl, duel voices, forked tongue, quite. Their aviation weather packages remain rather good as well. You are right, it’s a fifth column of zealots that have worked their way into BOM that are severely damaging it from within, and thereby pulping its reputation. They are going to need better leadership and discipline which quashes it before it gets any worse, and then set about repairing the damage to data sets, then slowly mend fences externally. But the days of taking them at their professional word now been replaced with taking their word with a pinch of salt (Epson salt that is). Epsom; I guess you were afflicted by predictive text…I was waiting for it just then but have been messed up by it frequently. It’s Jo Nova that is incompetent. how is it QLD total rainfall can be used as a measure of drought in some parts of the state? You have misrepresented and smeared the Bureau. Pure idiocy. Pure non-science. Pure Nova. “the Bureau of Met tells us that Queensland has experienced “the worst drought in 80 years” and that “37.3% of the state was covered by the lowest rainfall on record”. “how is it QLD total rainfall can be used as a measure of drought in some parts of the state? Chester needs the Evelyn Woodhead Speed Reading Course. So 37% of the state is in drought, yet a graphic – the time series – uses 100% of the state’s rainfall figures to make a claim the BoM was wrong. there could have been record rains in the 70% of non-drought areas. Like I said non-science and nonsense. Say what you like but these two are BOTH BoM (unless the ABC got it wrong), Both talking 100% of the state, and they disagree with each other. “Jeff Sabburg says the records show 2014 was the driest year since the Depression in the late 1920′s“. The BoM rainfall chart contradicting the above. Have another look at the last two maps of Australia and pay attention to the red blobs, I think you’ve overlooked this after years of conditioning to only notice ‘Green Blobs”. Hi Chester, why not check areas of Qld with rainfall deficiency on the BOM’s own website? Jo has given the link above. Actually I include another drought map in my post, showing rainfall deficiency in the 24 months to December 2003. The red blobs cover a much larger area than 2014. So it is possible to match statewide rainfall anomalies with drought maps. Now that is not to say that drought did not affect large areas of Queensland- a very large area is still officially “drought declared” and a good soaking this wet season is needed- but not for the length of time or severity as in 2003- or the 1990s or 1960s. Sorry Chester, you need to try much harder. D-. You guys are great at playing dumb….or are dumb. The time series graph that you use to indicate what you are claiming about the drought, is for all of QLD. Not the drought affected areas. You haven’t proven the Bureau or the ABC is wrong. And a similar mistake was made re the posts on ph. Now, let’s all give Jo some more money for her incompetence. So Chesty-bond, Have you actually check any of the BOM or ABC statements..
or do you, by brain-washing, just accept and believe. Never question, just go with what you are told .. that’s the way, little child. BELIEF is paramount for you, isn’t it. I know who you are now. Took me a while. I saw you on that ABC show – The Inventors. Yeah, you were the runner-up, tough break huh. Say, I was wondering, just how are those specially flavoured bus windows working out for you anyway? You’re right about one thing: rainfall figures for all of Qld can’t necessarily be used to compare droughts. However, the drought figures for 2003 quoted in Ken’s post are well, drought figures; they support Ken’s claim regardless of the rainfall figures. The BOM and the ABC are still wrong about the severity of the current drought. Sometimes Chester you are really dumb. Look at the first chart, by my Eye this chart has about 20% coverage of Queensland, which seems to be much less that the 37% the BOM has claimed, explanation from the BOM as to why this is the case is required (some of those shires are huge and drought declaration is done by shire so I wouldn’t be surprised if 37% of Queensland were drought declared). Now look at the second picture of the federation drought Ca 1900, by my eye probably 90% of Queensland was drought stricken so the claim of “Worst Evaaah” needs to be explained by the BOM. So based on the evidence this is not Queensland’s worst drought, except for those folks in the dark red areas of the map. Not to mention in large parts of the state we had mega floods in 2011 AND 2013. So at the very least the BOM needs to qualify it’s alarmist pronouncements, it is not Queenslands worst ever drought Brisbanes and the Gold coast water storage is around 80% (so 80% of the population has plenty of water), nor is 37% affected by area although it could be 37% DECLARED – which is not the same thing, since declaration is done by shire and depends probably more on the water storage capacity in those areas as opposed to the actual weather. Sometimes bobl, you are over generous. I don’t think I have ever seen Chester, not being three drinks short of a six-pack. Well, there you go – let’s use your eye to solve all of science’s problems, shall we? And, of course, that’s the same method the BoM would have used to calculate the % of the state in drought – eyeing a chart. This site has attracted dumb, dumber and all the dumbest. And they pay for the privilege of having their dumbness recorded. Yep.. here you are !!! A magnet for the most rabid brain-washed zombie alarmist. Too funny – I predicted you would give that response to my comment – Gristle Boy. Thanks for demonstrating the point so conclusively – you’re the quintessential Nova Groupie. Dream of me tonight, child..
Ah, Chester, you’re just another segment of the climate alarmist’s human centipede. One right at the rear !! Yet Chester doesn’t have to pay for the privilege of coming here and displaying his capabilities while insulting the site’s generous host at the same time as everyone’s intelligence. Who pays voluntarily to hear what he has to say ? I tell you what Chester if you can’t see that the second chart has more red than the first then I’d recommend an optometrist, or perhaps a psychiatrist, since maybe you are seeing what you want to see. What has been done here is a simple comparison, the ABCs declaration has been called into doubt and frankly it is up to the ABC now to justify their position. Queensland is just two years out from a major flood. Someone has checked their facts and there is evidence that the story is wrong and has said so, that’s everyones right in a country that values free speech. Chesty here is a Queensland drought less than eighty years ago that is claimed to be just a wee bit bigger than 37%. To help you with you calculations the current Antarctic sea ice area is about one area of Queensland. bigger than the satellite average. When the rain came for most of the rest of Australia “In Queensland the season continues very bad in most of the inland areas. The drought affecting most of that State has not continued entirely unbroken but except at a few places the falls received have been only light and considerable areas failed to participate in the rain. Oh and large parts of China. Oh and in the U.S.
,you are expected to explain how and why,if this is indeed the case. Most of the people here,don’t appreciate such smears being used under any circumstances whatsoever. Your an illiterate zombie, who has a track record like Nuttercelli, for not bothering to read the post in detail. He reads but does not understand. We could have done without that last sentence Olaf. Correct Chester – Nova and Stewart are clueless. You just have to laugh. BoM’s statement is correct. Fancy putting up a whole of Qld time series analysis with both very wet and dry parts of the state to confound a spatial analysis. Another low grade post like the pH bilge. What a hoot ! BoM must be laughing themselves to pieces with high intellect shown here. Another one for the Nova prangs scrap book. No skeptics here – they’ll just run with whatever the “gurus” tell them. Fancy taking Stewart’s word for anything. (I think they want to say that the Federation drought was worst on record spatially and temporally and maybe it was but that’s not what was reported). Thanks for endorsing my point. Maybe the Federation Drought “was the worst”. Let me know when the ABC corrects its story, and starts giving Australian’s the whole perspective instead of the propaganda one, OK? Typical Nova sociopathy – unable to admit being totally wrong. Nova (not her real name) will be here posting d-crap when the rising oceans are lapping at her ill-gotten keyboard. And asking for money for doing so. Chester.. possibly his real name. What are your smoking? something ‘new’, that’s for certain !!! No it’s not OK. You’re presiding over an illiterate whinge fest about BoM and you are endorsing the usual quackery we get from Stewart. Fancy using a whole of Queensland number to discuss a regional drought. And he should know as he’s at ground zero (LOL). What BoM have said is correct. You should be more sceptical of the drivel you are sent by activists. All droughts are different – perhaps they should just campaign that they have not discussed 1991-95 drought too and a myriad of other interesting event trivia. Low news week eh Jo? Mr anonymous, you are good at namecalling, not so hot with reasoning. Just point to the part in the ABC story where they describe this as “regional”. They went with the “worst ever” message, it only takes a couple of words to make that slightly accurate and informative rather than grossly misleading. Even Hussey didn’t bother to quote those careful caveats, because they were never said were they? Go right ahead and list the hard questions they asked Mr Jeff Sabburg. It’s a natural for a whining bedwetter – just dob her in – see how far that gets you. Might be good for a giggle. Other than that I’d say your multiple contributions has assisted in another blog award for Jonova this year, and don’t forget, you and the other human centipede alarmist segments only help to maintain Jonova’s KPI’s. You poor little irrelevant child. Bring something to the table other than desperation next time. You are just as empty as all the other brain-washed ranters that cannot back up a single word of their verbal spew with any facts. And yes, there have been many of them throughout even the short span of Australian history. …. there is NOTHING UNPRECEDENTED happening with climate anywhere in the world. !!! In fact the last several decades have actually been rather benign in the greater scheme of time !! Even the Clim Syndicate thought the BOM was a joke in the ClimateGate e-mails. I heard the alarmista get their level awards from how many hours of ABC they watch a day. Or how many times they have attended the John Kook “climate” course. ! Its actually from their position in the conga line. Mmmm, ah, well, you see that’s not a conga-line that alarmists join… haven’t you seen ‘The Human Centipede’? Yes human centipede would be a more apt description. or maybe the human centipede.! darn James.. I was reading an older page.. sorry for stealing your truth. Here is a chart to check it against. .. and is therefor nothing unusual. Are these alarmista so ignorant that they don’t see that ! I do not comment often, but I have to say that the amount of new scientific studies being released by many and varied scientists around the world in the past year that totally point away from any role of CO2 influencing the planets temperature in any way. The previous sentence may have been long but it is true. The alarmists here attacking our good host are trying to plug holes in a sinking ship. In times of yore scientific malfeasance was reasonably easy, as the message could be controlled, the internet has made it very hard for them. The likes of this chester person would in the past been believers in Phlogiston. No, can’t read and is among the living dead. If you had read, and comprehended, what Jo actually wrote, she was actually pointing out that the ABC was the party misrepresenting and smearing the Bureau, through their poor reportage and fanatic desire to always be he harbingers of doom. In fact Jo points out that the bureau says one thing, whilst the ABC says something else, in an attempt to sensationalise it. That is not good journalism. In the same way, you were so determined to use your cute (but meaningless) alliterated phrasing, on the word “pure”, that you only saw what you wanted to see. You are very transparent, you know. In the search for sensationalism, the BOM is becoming worse than the cricket, except cricket experts would be horrified at such a manufactured wrong statistic from people paid to get it right. Is there a small group in the BOM who are tasked with creating drama? What happened to the devastating cyclone last year which was supposed to be worse than Yasi and wipe out FNQ but made no more impact than the usual storm? Newspaper headlines announced total devastation, courtesy of disastrous BOM predictions. Then the BOM were full of easy explanations after the event. We the employer want the facts, not headline grabbing sensationalism. So where are the ABC Fact Checkers, an expensive department wholly to prevent misinformation from anyone? To go to the argument that they just report stuff without checking, even when questions are asked, is a travesty. As for the iView, it has been suspended while the ABC looks at putting it behind a firewall as they consider charging for the story and morph into unaccountable privately controlled self justifying commercial organization. Just like Fairfax except for the $1+Bn in public money they soak up every year. Why should they compete in the internet? What special honesty does an uncontrolled, independent but publicly funded organization bring to the internet? What special local Australian content? What local news? What local production? A GM on twice the salary of the Prime Minister? A publicly subsidized commercial ABC competing makes no sense. Peppa Pig is a UK import. The big question is whether the BOM is presenting this as Global Warming or even Climate Change or simply the climate? Or are they trying to worry the farmers who are facing devastating continuing drought if the monsoons fail again? From the weather map, there seems to be a lot of hope so perhaps it is the last opportunity for doom and gloom from the last nationwide drought? Who needs fabricated disaster stories from the ABC? We are paying for the truth, nothing less. We can choose to pay for sensationalized news. Sell the ABC. The internet and the NBN have made a huge publicly funded allegedly impartial broadcaster absurd and so 20th century. BOM are now regularly having to explain to incensed locals their (once unheard of) ineptitude and tardy (outdated and not updated in time, nor even accurate) tropical cyclone warnings. They probably should also wait until a swirly 25 kt tropical storm at 999 hectopascals actually has a closed eye circulation and a central dense overcast around its entire periphery, before even thinking of naming it a ‘cyclone’. Every time the BOM name cyclones the locals are not fooled, the average observer does in fact know the difference just by looking at the imagery. Plus having an inexperienced 22 year old from BOM in Melbourne, on ABC 24 telling locals in NQ or Darwin about cyclones, is unwise to say the least. Indigenous tribes have Elders for a reason, they’ve been around, they know what’s what. BOM and ABC might want to consider that and use far more experienced spokes people and field specialists (preferably not in Melbourne) if they want to build back cred, be listened to, and actually inform people (that is the point, right, ABC?). As it’s so often stated around the world, the media is the problem. And every sweeping statement can readily be shown to be a lie. The valleys in my area which are very sandy soil and which parch noticeably in any bad [but not exceptional] drought such as we had last year, remained surprisingly green. BoM – 2014 was Australia’s third-warmest year on record: our interactive map shows how it compares to the past 100 years. “Crucially, the service omits weather warnings. The bureau warns users not to rely on it when extreme weather has been forecast. “It is provided as a public service and data should be used entirely at your own risk. MetEye does not replace the bureau’s official forecasts and warnings. It should not be used for critical decision-making,” a statement on the bureau’s website says. Isn’t “revolution” just another word for spin? Hey, HJ Notice the page that I link below to rainfall starts in 1900. While the temperature map starts in 1914 !! Now, I wonder why they would do that.. Even the cherries don’t buy the BoM’s doomsday sermons. Knowing a little about science I just wonder how can one give such precise temperature data, a 0.71 to 0.76 degree increase since 1960, when it is difficult to measure accurately to more than, say, 0.2 of degree. The standard error would more likely be 0.70 plus or minus 0.25, wouldn’t it? But how many Senators would know much about science anyhow! That is the problem. Senators? It was a British Prime Minister, Benjamin Disraeli, who labelled statistics the 3rd degree of untruth, above lies and damned lies. Not only do the BOM officials exaggerate the precision of their estimates, they also are into prophesy, when they talk about “a clear warming path”. Maybe someone at the BoM can explain this graph. How does this show an increase of 0.71C/0.76C since 1960? This ‘Time series’ graph clearly shows about -0.1C in 1960 (mean 21.7C) rising to +0.4C (mean 22.2C) in 2013. This is an 0.5C, around 0.2C less than what the BoM has asserted. One of the things I look at in terms of veracity, is the precision (the number of decimal places) of what is being reported. The BOM are fond of reporting temperature to two decimal places, i.e. in hundredths of a degree. Can we measure temperature to that precision? Yes we can, with the most up-to-date equipment. But what of the historical temperatures that the current temperatures are compared to? Well, at best, they can be accurate to one-tenth of a degree, and in most cases only to half a degree. When you understand that, and see that the BOM are actually talking in terms of mythical numbers that are only a teensy, bitty, higher than their base figures (which were inaccurate anyway). The BOM do not lie. The just use math in unexpected ways. Another example of this, Rereke. The AWS thermometers are quite sensitive and react very quickly to sudden changes in temperature. The older mercury thermometers were not as sensitive. Therefore maximums will be a little higher than the past (and, of course, minimums will be a little lower). gees, on a hot day, a BOM guy could go out and open the Stevenson Screen at the hottest part of the day..
Nah.. would never happen… would it ??? Remember it well, tG. Temp rose 0.9C in 4 mins and then dropped 1.1C in the next 6 mins. There you go – a new record for Sydney. Where they got the 45.8°C value from is anyone’s guess. !! Misreading the hand-written figures. It is easy to interpret a “3″ as an “8″ if it is written in a rounded form. Further to my post re electronic thermometers, I just found this at: http://notrickszone.com/#sthash.TGoBH0E8.dpbs. From meteorologist Klaus Hager who was active in meteorology for 44 years and has been a lecturer at the University of Augsburg for almost 10 years. He is considered an expert in weather instrumentation and measurement. Yes, this is a point I have been making recently. I previously lived in Lightning Ridge (it gets very hot!! ), where it’s very easy to actually feel these momentary spikes in temperature…. as a hot breeze comes by for a few moments, then the temperature drops again. A bulb thermometer would never measure this, whereas an electric thermometer would. I think you would see even higher differences in warmer climates. For the USA, I found some rather interesting books/journals on temperature measurement that calls into question all the ‘Adjustments’ made to older data at least in the USA. Unlike today these people were true and careful scientists. They also give the error for the instruments and the reading techniques. What is interesting is two different thermometers are used. An alcohol for the minimum readings and a mercury for the maximum readings. Both are provided by the US government plus precise instructions for building a Stevenson screen and where it should be located. The reason for the use of two thermometer as Willis Isbister Milham states in the following book is that they are more precise than a Six Min/Max thermometer. Willis Isbister Milham also states there are 180 to 200 ‘regular’ weather stations ordinarily in the larger cities, 3600 to 4000 coop stations and 300 to 500 special stations. He seems to imply the ‘regular’ stations are professionally run stations. The observations of temperature taken at a regular station are the real air temperature at 8 am and 8 pm, the highest and lowest temperatures of the preceding 12 hours, and a continuous thermograph record…. (Richard Freres thermograph) ….these instruments are located in a thermometer shelter which is ordinarily placed 6 to 10 feet above the roof of some high building in the city. At a Cooperative station the highest and lowest temperatures during a day are determined, and also the reading of the maximum thermometer just after it has been set. The purpose of taking this observation is to make sure that the maximum thermometer has been set and also to give the real air temperature at the time of observation…. …the average temperature for a day is found by averaging the 24 values of hourly temperature observed during that day…. ….If the normals are based on twenty years of observations, it will be found that there is not an even transition from day to day, but jumps of even two or three degrees occur…. I thought it quite interesting that Willis Isbister Milham was talking about 20 years of hourly data in 1918 as well as taking precise reading at 8 am and 8 pm. Shoots down all that TOBS ‘adjustment’ nonsense doesn’t it? The Ventilated thermometer which is the best instrument for determining the real air temperature, was invented by Assman at Berlin in 1887…will determine the real air temperature correctly to a tenth of a degree. Being an invalid, I must beg for the indulgence of the Society for the irregular times of obervation and the other defects the Fellows may discover in the following paper. I stopped looking at MetEye when I noticed it consistently reporting surface temperatures in the local Coral Sea well above 30°C. As far as I can tell, the monthly weather tables at eg http://www.bom.gov.au/climate/dwo/IDCJDW4128.latest.shtml don’t get fiddled with, but they do disappear after 14 months. For Townsville Aero (in the “dry” tropics) I have the CSV files from 08/2004 to 05/2012, and the annual average rainfall for that period was 1437.2 mm, compared to the stated long term average (eg from commencement in early 1950s) of 1121.5 mm. So the “rainfall deficiencies … across Queensland” also looks like spin. What does a six square kilometre grid look like? And how many such grids are there? It would be much easier to visualise a six kilometre square grid. And it would be much easier if we could have confidence in the quality of the journalist’s grammar. Whichever it is, what percentage of units on this grid have recording facilities? Only satellites could measure them. So how long have the satellites been doing this? Ah, this system is brand new! Unfortunately in a “climate” of questionable integrity. So how can it be compared with previously available systems? Only roughly. That rainfall graph looks very realistic and normal for this part of the world. Yep it’s quite chaotic, with it’s very irregular & highly variable highs and lows. What’s up BOM, has your homogenizer stopped working? An ABC page that covers all Australia, year by year. Hint. droughts occur in Australia often and in variable places. Seems we have 3 people (at time of this post) that object to a link to actual INFORMATION, even though it is from their ABC. I assume those 3 people (or bots) are brain-washed alarmist cult members. INFORMATION scared them, it seems. My current working hypothesis is that it is a trifurcated clone auto-red-thumb-bot with one owner, working in tandem on their eyefoney, slatetabletpadthingy, and their PeeCee. Their mummy will be very annoyed when she finds out! This is a scandal, but will the taxpayer receive an apology? Everyone here knows this is idiotic nonsense so why doesn’t their ABC and the BOM? What are we paying these fools for? Maybe climate is changing back !! The effects, both physical and financial, of the current drought in northern Australia have been greatly exacerbated by the fact that Australia was overstocked with cattle when the drought started. This was the result of the stopping of live cattle exports to Indonesia in 2011 by the Gillard/Brown government, undertaken at the call of an animal liberation group calling themselves Animals Australia and the ABC’s 4 Corners program. The cattle which were supposed to go to Indonesia were still in Australia eating grass. When 4 Corners put to air the video which had been made by AA, the objective for both, and of the government also, was to create the financial situation we see today, with a large part of Australia’s cattle industry bankrupt. People who do not understand the whole story are now blaming the drought for the bankruptcies. The drought was just piled on top of pre existing problems which had been deliberately created by government. Global Warming sceptics would do well to study this story. It is part of the same overall plan, driven by a bizarre alliance of two groups of 1. people who subscribe to the teachings of Marx and 2. people whose greed knows no bounds, each group believing that when it has gained full control of the economy it will be able to annihilate the other. I must admit, this article referring to the ABC does use a phrase that obviously is inappropriate. When it says “any serious journalist” it used 2 words that quite obviously don’t apply – serious and journalist. Even a parrot would be ashamed of repeating ignorant drivel, which this “journalist(? )” doesn’t seem to mind. I assumed it was a typing error, with the word “serious” being typed, instead of “spurious”. Using voice to print technology does that sometimes. Well done. Corporations like the ABC and BBC need to be held to account. Unfortunately, the BBC (and I suspect the ABC) seem to regard themselves as above criticism. But whatever they want it to be. Someone or something gave you a red one… They’re out in force. The more repeated blind-red-thumbs the better. It means people who disagree are reading. I love that. I know I’ve got their attention ! I am on their minds and in their thoughts. They can’t handle your sharp dry witted humour honed over many years in slapping down feral students. Those feral low-IQ student had far more to offer the world than these guys. These red-thumb guys are so illiterate that they can’t even voice a basic response. Some of them will actually end up with a worthwhile job !! I have no doubt that some of them did get a good job thanks to your efforts. Al Gore students cramming early for 1st semester assessments.. I got the most so far in this post – and that was only on one of my comments. I got KPI’s to maintain too. Unfortunately, with 24 hour media coverage they are always looking for some sort of story to tell and do not bother to verify its veracity; nor do they bother to apologise when it is pointed out it is wrong. That is the media culture of today. Certainly there is severe drought in parts of western Qld. ; that is not in dispute, and will hopefully be negated this coming wet season, but the lack of professional journalism and bias is a deep-seated problem in many media outlets the ABC not withstanding. Believe nothing of what you hear and half of what you see and you cannot go wrong. Has anyone looked at the current Qld weather forecast ! roflmao !! Probably same as the rest of the country – Pi$$ing down. I just think its rather funny that BOM are talking drought in Qld.. and along comes a deluge ! Yeah, anyone can tell you what the weather was like last week with 100% accuracy. And we don’t really want to know that last week’s dry spell could be different from all the other dry spells for the last 100,000 years because this one may have been caused by cow fart$. That’s not what we’re going for with the Bom is it, I mean that’s not really in the BoM portfolio. What we want to know is what will happen next week, next month, next year. They could call it long range weather forecasting. I’m sure there’ll be a quid in it someday. The BoM should contract Haydon Walker. Can some of our friends in N America or Europe give us an update on your big freeze, Anthony has been a little absent this Christmas (On vacation I think) in particular I’d like to know how the great lakes ice cover is doing? I heard on NBC that New York was expecting 2 feet of snow? Oh for some global warming hey? I’m off to Philadelphia Thursday, via LAX and Detroit for 3 months, so I’ll let you know. Yes, I have been watching the weather closely ! Don’t want to get stuck in Detroit ! Also wondering if I’ll get at least 2 red thumbs !! No such luck mate – the auto-red-thumb-robot ran out of energy and only gave you one. They just can’t build ‘em like they used to! Especially if you are outbound. Yes, I was stuck in Detroit for some six hours about 30 years ago due to a snowstorm, maybe life does repeat itself. Thanks Mark. Isn’t weather odd just when you think the world is getting hotter momma nature throws in a curly one or two. with this current image: http://coastwatch.glerl.noaa.gov/glsea/cur/glsea_cur.png Showing 15% ice coverage. Superior is cold though and I expect she’ll rapidly develop ice if there are some calm days. Erie looks like she might be iced over soon and that will put an end to lake effect snow. 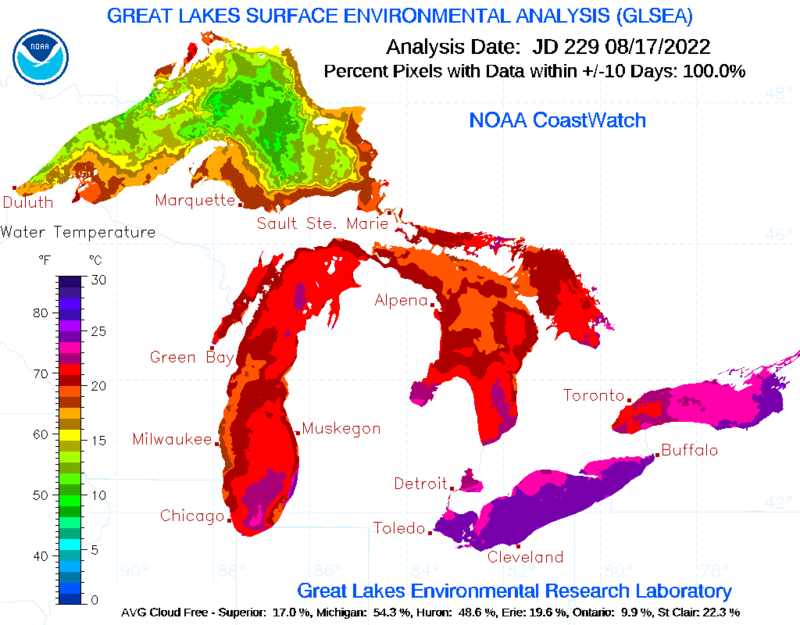 Funny the experts were suggesting that Superior would have a tough time icing over this year owing to a much increased water volume because of last winter’s snow (way above normal). We shall see. I think we’ll see a lot of ice soon. No or low snow is a significant problem here as the frost goes deep into the ground. We’ll have frozen water mains and septic systems that stop flowing if it stays this way during the coldest -20F -30F days ahead. Besides that, without snow there is nothing to do for fun (snowshoeing, snowmobiling etc.) I can tell you that winter birds are scarce at my feeders this year. It’s been tough for them. IceAgeNow(dot)Info keeps track of the major cold and snowy weather events around the world. Funding of the ABC must be reformed. I believe they should get all the funds they require from the carbon tax. That should sort that one!!!!! If we can’t privatize it, it should be a voluntary “tick the box” option on tax returns. With 11 million taxpayers, that would be $100 each per year, except if half say “no thanks”, that either cuts the ABC budget in half, or means people have to pay $200 each. They should just regulate it with an ombudsman and have a truly independent complaints process, with teeth, fines/removal of content or people. The public can keep them honest given the mechanisms to make complaintsare put in place. Given the poor responses of the complaints unit to 100m Williams equating of 57% of the population to Rapists and Pedophiles, and Dr. Karl’s keenly defended misrepresentation of the Met office , I don’t hold any illusion that the public can exact any retribution on the ABC for it’s green propaganda efforts. The ABC is about the only government organisation that is not properly accountable to a minister (peoples representative) as well. So there is very little public accountability of the ABC at the moment. Not that ministerial accountability is desirable. Every other media organisation is accountable to ACMA, but the ABC is exempt from ACMA oversight. Make the ABC simply play by commercial media rules by extending oversight to it the same as Commercial media. That idea didn’t work with the BBC they just ignored the complaints and then had the usual rubber stamp from the review board when the outcry became too loud. So the BBC keeps on reporting rubbish and censoring skeptic comments despite the complaints. If the entire system is dishonest the only option is to toss it or make funding completely voluntary as Jo suggested. Or maybe, as the ABC is the ‘people’s station’, those elected to the board should actually be elected by the people. Isn’t the ABC for telling us what we need to hear ? Even church tithes are voluntary though and who would consider the ABC to be greater and more deserving than their Church ? Unless it is their church of course. If the management of the BOM and ABC were reversed, nobody would know the difference. I was listening to Radio National the other day and they had a segment on “cover version” songs (pretty in depth journalism). One of the things they mentioned several times was that many of the tracks they played came from the JJJ “Like a Version” CD. So ABC will not promote products or services…. unless of course they are ABC products and services. Why we tolerate a tax payer funded, left/green think tank which competes with legitimate private media outlets and makes up the rules as it goes along is beyond me. CAGW scepticism in Brazil, in India, & now Japan Times picks up George Will’s Washington Post article! whatever next? google’s al-gore-ithm results i got from a search of “george will learn from climate change’s instructive past”. below is what immediately followed the WaPo result…talk about doubling down! clicking on “news” there were approx 150 results in the first grouping but, clicking to see them, the Japan Times (or Daily Mail or other MSM who picked up the article) results did not show up. instead, i got just a few links with the following included, & nothing further if i clicked on “omitted results”. the MSM (incl google) is the problem. That link is forbidden, Pat! “All scientific work at the Bureau is subject to expert peer review. Now, we here @jonova could spend hours searching BoM archives for any transparent examples of the non-peer reviewed methodologies that the BoM/UN-IPCC use to advocate for carbon(sic) action. Instead, let’s wait for ‘the red thumber’, or someone, anyone, to post a link to this non-peer reviewed information. Dr Scott Power, a researcher at the Australian Bureau of Meteorology, said the world would use up its “carbon budget” in the next two decades, and if it overspent that budget, then the world would warm more than 2 degrees, leading to more severe impacts from climate change on people and ecosystems. At an IPCC meeting in Berlin this year, there was heated argument over the economics of climate change, and the relative obligations of different countries in the developed and developing world. That is the same Jeff Sabburg (Dr), who can’t read his own BOM rainfall charts and misinforms the ABC. What I find strange is BOM are giving temperature reading at Penrith lakes, Penrith lakes is a man made lake scheme is only 16 years old and the body of water which has getting greater ever year ; How can you get an accurate long time temperature from that ? A summery of the current rain event you wont see on the ABC…..or any other MSM for that matter. Someone with a better maths brain than mine may like to calculate the area of Australia currently under flood watch. Its been a long while since there have been flood warnings in all States and Territories except Tasmania. Hopefully this is the break in the pattern which ends the drought cycle for awhile. Moderate flood warning for the Bulloo, Paroo, Lower Warrego, Nicholson and Leichhardt Rivers. The forecast heavy rain may lead to significant widespread flooding during Friday and Saturday over the Pastoral districts. During Saturday, Sunday and Monday these conditions will extend over the Flinders, Mid North, Riverland and Murraylands. Rainfall may lead to significant stream rises and possible flooding in the Mount Lofty Ranges during Saturday, Sunday and Monday. Flood Warning for the Fitzroy River Catchment, Northern Interior District, West Kimberley including Cape Leveque. Flood Watch for Western and Eastern Inland Rivers. Catchments likely to be affected include the Todd and Finke Rivers. People planning to travel in the Tanami, Barkly, Lasseter and Simpson districts are advised to check road conditions and weather forecasts before embarking. Flood warning for the Warrego and Paroo Rivers. believing Government is responsible for a “stable climate”!!! It was a very tense time for Dr David Shearman, Honorary Secretary of Doctors for the Environment Australia, with the fire front kilometres away from his home. It was also, he says, another timely and urgent reminder for the Federal Government that human health is fundamentally dependent on a stable climate and healthy environment and both should be public health priorities. interview with Pachauri who says Govts may have to keep global temperature rise to 1.5 degrees! ***for comparison, Reuters has reported that 210.6 million tonnes of coal were imported by India in 2014. Thanks Pat for the update. The peddler of pururlent potboiler paperbacks, Pachauri, does not understand that India is being proactive, rightly proactive about its best interests and not the UNs interests. If only the rest of the world would wake-up and start to follow India’s, Canada’s and Australia’s lead. “Dr” Shearman probably doesn’t have a doctorate in Medicine. “Doctors” for Environmental Australia is misleading as most of them would not possess a doctorate. The French use the term Medicans san Frontieres when referring to a medical organisation. Shoud use Medical Practitioners for Environmental Australia. This lowers the apparent prestige of the group. Just another pseudo-academic jumping on the climate funding bandwagon. Keep reading my posts, you might learn something. That book hasn’t actually been written yet, but keep it up, it surely will become a best seller. Australia….. A land of drought and FLOODING rains !! And you wonder why you are continually called out for cherry-picking ? Look at the first of the charts with red on it. The majority of that red is in NW Qld. Mt Isa region. ! Those two point just happen to be the first two I checked in that region. Feel free to check more for yourself (if you can figure out how). The main pocket of drought in the second figure is around Mt Isa region. Where would you suggest I look for rainfall data?? Townsville? Adelaide?? Time we sent a “please explain” to BOM and ABC for every one of their blatant lies. Reports like this serve as reinforcement of pre-existing beliefs for the faithful, the general public having tuned out long ago. It’s like the oft-repeated slogan that ‘2014 was the hottest (or near-hottest) on record’ which offers the CAGW enthusiasts reassurance that things are really as bad as they hoped despite the GT remaining static for over 15 years despite record high human CO2 emissions. Unfortunately, over half of the Australian population still believe in AGW and I blame the ABC. A Lismore man will leave on Monday on a 12-month, 8,000-kilometre kayak journey across the world to raise awareness about climate change. Steve Posselt, an engineer, author and adventurer, will be farewelled by Lismore mayor Jenny Dowell from the Lismore city council chambers at 10.30am. From there Mr Posselt will travel to Canberra to begin his journey, which will take him throughout the length of North America and into Europe. After the Lismore engagement, Mr Posselt will depart Engineering House in Canberra on Thursday 15 January. From there he drags his kayak to Port Kembla on foot and then paddles up the coast via Wollongong to Sydney, arriving at the Opera House at mid-day on 31 January. From Sydney, the adventurer will board a plane to the Gulf of Mexico where he paddles north up the Mississippi, up the Illinois, through the Great Lakes and all the way to the sea at the top of Canada. He then flies to the United Kingdom where he will paddle across the UK including the Thames, across the English Channel and up the Seine to Paris for the UN Climate Summit in November, 2015. What? The UK flooding that was down to the lack of dredging? The flooding in Cockermouth that was also due to lack of dredging thanks to the ‘need’ to preserve salamander habitat…never mind human habitat? Silly me…salamanders are so much more important than mere humans. I hope this kayaker will keep a record of how many thousands of CO2 tons he emits while flying to the US and while he’s exhaling during his indulgent paddle-trip in non-hazardous zones. At the end of his pointless non-spectacle, I hope he’s kept track of how many Salamanders he’s saved. CBS’s Casey on the University College London study i commented on on a previous thread. rather sceptical, wouldn’t u say? Imagine a world where coal is all but banned and the use of gas to fuel economies from China to the United States has been severely curtailed. …the authors didn’t touch on how economies especially in the developing world can transition away from their heavy dependence especially on coal. India and China, especially, have shown no inclination to give up coal in the near future. They also don’t get into what would replace fossil fuels. EU facing reality at last? Jos Debelke says Brussels is committed to climate leadership, but will help steel, cement industries to comply with rules. But during a TV debate in Brussels, he dismissed the idea the EU would impose tariffs on high carbon goods from India, China and other competing economies. Londoners have nearly half the emissions of the average UK citizen. How quickly conditions can change. and a tropical low is predicted to move into the Southern Gulf region by the 15th. Very happy for the cattle and folk in Western QLD. Gaia really doesn’t like the alarmists, does she. She does her best to provide contradictory events every time they predict something that’s for sure. The BOM haven’t explained why there is La Nina conditions in Australia and US at the same time or why their predictions of lower than average rainfall is going bust. The ABC seems to have arrived at the same territory as the BBC, wherein every story MUST be framed in terms of Oppressor/Victim (chosen from the ‘correct’ categories, of course). The drought in Qld is an easy one. Victims are ‘poor communities’; oppressors are the usual ‘carbon criminals’, i.e industry, capitalists, blah blah. In fact, every story about climate can be framed in these terms, which is why it is such a popular theme. When watching ABC/BBC, play the Oppressor/Victim spotting game for yourself; it’s very entertaining. A rather sick game though. I do see what you mean; the BBC and BBC are right out of order. I used to want to put an axe through the tv screen in the UK because of BBC bias and I feel the same here in Aus with the ABC . Seems to me that we might be experiencing a new phase in the CAGW shenanigans. Prior to the last year or two if global warming alarmist were caught cheating in their science or lying in their PR, they would deny it and fight back, usually by smearing or denying FOIA requests to cover up their misdeeds. But recently, they pull their shenanigans and get caught they just ignore the critics and let the MSM, public and private, widely disseminate the “news”, ignore the critics, and thus suppress the truth, and then move on to the next scam. Maybe they know that fighting with their critics just give them press coverage too. So just ignore them and know that the MSM, UN, unscrupulous NGOs and governments will protect them and squeeze the critics and their truth out of the media, and thus, out of the public notice. If only the funding could be found to give the ABC the resourcing to actually “check facts” rather than blindly repeat BOM alarmism / activism. Perhaps with as little as 1% of their total budget they could have a “fact checking unit” of some kind. But why do they now make a song and dance about it? Has it not always been the role and underlying responsibility of professional media to check the facts first, not as some smug ‘special’ touted service, but just as a matter of course in a professional journalism context? Are we supposed to now fawn after and worship people who make a special show out of merely doing the bare minimum the profession, their employment provisions and their job description requires of them, from the get go? So what were they doing prior? Monckton discusses One World Government run by Climate Communists getting close. Malcolm Turnbull gets a mention. Why , with posts like that of gbees’and Monckton , are you surprised you are accused of being a sanctuary for CT ? CT = Climate Truth !! Turnbull ticks all the boxes in the previous guest post submitted by Rereke. Fortunately the Australian public will never elect a merchant banker (which is rhyming slang anyway) so we wont have to worry what Malcolm thinks except for his ability to undermine Abbott at every opportunity. to Labor where he belongs, then get rid of Shortbrain.! I am led to believe that Malcolm has already tried but couldn’t get pre-selection. bloomberg’s sustainability section has had an Eric Roston headline “Top U.S. Executives and Officials Are Fairer Than You” on its homepage since it was first published on 16 December. first time i have ever seen an article held over so long, so i finally decided to read it. A new study challenges the image of high-ranking leaders in U.S. business and government as ruthless negotiators hell-bent on defending their own interests. Previous studies about elites have assumed that VIPs are likelier “to exhibit self-interested, profit-maximizing behavior” than people without their experience, such as college students or people living in rural Africa who have taken similar tests. Identifying those common interests could help keep the climate in check — or simply let piquant family discussions at holiday dinners end in peace. I’m not sure but this BoM’s rainfall deficiency map doesn’t show this to be a fact at all. There are only a few spots that show ‘Lowest on record’ and this is from 1 Oct 2012 to the present. Surely with Ken’s graphs it proves his statement is misleading. Because no government has the balls to hold them to account ..
… because BOM has the support of the ABC/Fauxfax media. !! Another interesting map is the BoM map showing ‘highest on record’ decile ranges for temperature for the past two years. Not sure how this works but I presume it purports to be what the BoM claim i.e. ‘highest on record’ as they show decile 10 below it. I checked St George which is in the ‘HOR’ shading and found that 2013/14 has been beaten on at least three occasions – 1979/80, 2002/2003 and 2005/2006 with the latter being the warmest. I suppose others can check their locations and see if the map shadings are correct. They cherry pick the length. Its the lowest for 24 months in the above. If your ABC was incompetent they would find out. Oh, They are and they haven’t. I wonder what the Fact Check rating on this sort of hyperbolic drivel would be? It is perfectly clear that for the alarmists now, due to a distinct flatline of the Global temperature trend for 18+years, everything and anything must be harped as “climate change”. Never mind that everything are well within the bounds of natural variability. So 7th place for 2014. Thanks to the Griss for the peer review. A timely post Jo. Peter Martin of the Sydney Morning Herald hasn’t got the message – but that is unsurprising from this masthead. Comments are open so would be good if we can get something past the moderators that challenges Peter’s notion that we should all accept what the BOM says without question. The Age is concerned about taxpayers funding pseudoscience: http://www.theage.com.au/federal-politics/political-news/taxpayers-to-fund-teaching-of-pseudoscience-20150110-12i8fa.html. Pity they don’t assign that same concern to another pseudoscience. If you know what I mean.